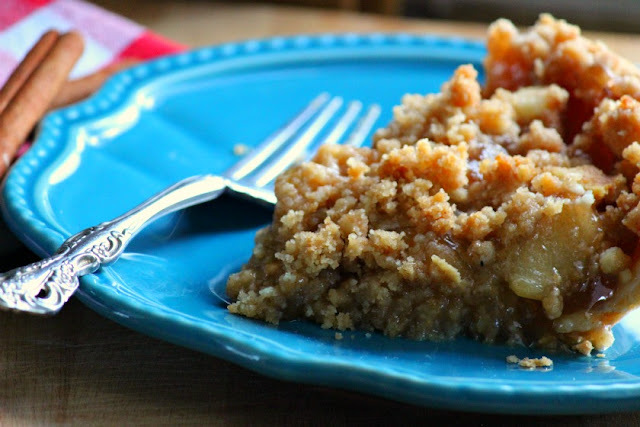 Marie Callender's Sweet Momements - Dutch Apple Pie & Holiday Sweepstakes! "In the childhood memories of every cook, there's a large kitchen, a warm stove, an apple pie and a mom." With the holidays quickly approaching, it's time to start thinking and planning meals for the upcoming get-togethers with family and friends. It seems that everyone is so busy these days, that sometimes holidays are the only times to bring everyone together for a delicious meal and spend some quality time together. We all have many fond memories spent together with family. It doesn't get much better than families gathering together around a big table, laughing over old stories, enjoying good times, hilarious tales of cooking misadventures and savoring nostalgic memories and the twinge of sadness for that special person who can no longer sit with us. Meal planning and preparation can be exhausting for a large crowd, but when you begin to smell the familiar aromas coming from the kitchen, you are attached to the smells and tastes and sounds of those special days. Apple pie baking has to be one of my favorite food memories that embrace the best of times. We had an apple tree in our back yard and all of us would sit for hours (it seemed) peeling apples for pies. Marie Callender's delivers homemade quality pies without compromise. Their special signature touches give you one less thing to think about when serving dessert at any gathering or special occasion. The desserts take the stress out of preparing the sweet ending to your meal. Be sure to visit Marie Callender’s brand page on BlogHer.com where you can read other bloggers’ posts! It reminds me of Thanksgiving! The scent of fresh Apple Pie reminds me of my mother. She is in heaven now, but she made the best Apple pies when I was growing up, and I remember her happy face, and I had so much fun helping her make pies! The smell of a baked apple pie always reminds me of the holidays and family dinners. The scent of fresh baked apple pie remind me of the kitchen of my grandmother. Baked apple pie reminds me of my daddy! He loves apple pie and I make him one every year for his birthday! The scent of fresh baked apple pie reminds me of my grandma. She made the best apple pie ever! The scent of apple pie reminds me of my grandmothers house and the holidays. She made apple pie each year come fall.